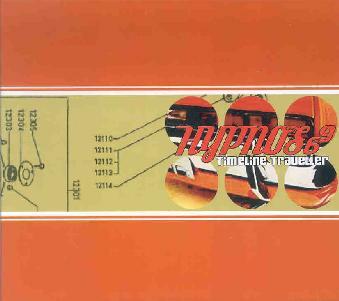 Hypnos 69 - "Timeline Traveller"
Take some stellar guitar work, a tight and creative rhythm section that refuses to fade into the background, and some cool, spacey synths, Rhodes piano, organ, and effects. Blend them together in the style of classic Deep Purple and Uriah Heep. Ensure, however, that all ingredients are fresh. Season liberally with Hawkwind. Add a dash of Led Zeppelin and a pinch of King Crimson. If something is missing, throw in some theremin. Bring to a boil, and serve steaming hot. The result will be a tasty Belgian dish known as Hypnos 69, and listeners can try out this delicious sonic stew on the band’s debut album, Timeline Traveller. As is suggested in my little recipe above, the band does tend to wear their influences on their sleeves, but they refuse to tread over old ground. The classic heavy 70’s sound may be there, but the songs are fresh and original. The opening title track alone is worth the price of admission, as guitarist Steve Houtmeyers lays down some seriously smoking riffs. Halfway through its 8-minute length, it slips into a spacey jam with great percussion that builds steadily to a blazing finale. The nearly 6-minute Voodoo Dancer is perhaps the most conventional rocker on the album, but Houtmeyers’ searing, bluesy guitar work will have aspiring air guitarists freaking out in their living rooms. The piece ends with a cool Hawkwindish space rock finale. While three of the five tracks have vocals, singing is not what this band is really about. All three members are multi-instrumentalists, superb players that focus on complex arrangements and scorching instrumental magic. The almost 8-minute, entirely instrumental N.O. Mustang is perhaps the mellowest piece on the album, but showcases the excellent interplay between Tom Vanlaer’s throbbing bass playing and Dave Houtmeyers’ inspired drumming, while Steve churns out some echoing guitar that shifts from bluesy to jazz influenced, to weirdly psychedelic. The 9 ½-minute two part instrumental A Neverending Enigma shows off the band’s prog rock tendencies the most. There’s some very tasty bass work in the first part, Sometimes I Wander, with its complex arrangements that echo a bit of Frank Zappa. The second part, Upwards and Unexpected, is a moody Rhodes driven jam that builds slowly but surely to a fine, rocking climax. The album closes with Like Waves on the Wind. After a smart intro of powerful guitar and organ, it lopes along in a bluesy manner before dissolving into a haunting refrain, like floating on some alien ocean. Again, the piece builds slowly, shifting and changing, building to a heavy climax before returning to the original theme that started the piece, finishing off at 9-minutes in length. If you like any of the band’s influences I mentioned above, you can’t go wrong with Hypnos 69. This is one of the best albums I’ve heard in 2002, and highly recommended. Visit the band’s web site at http://www.hypnos69.cjb.net, and download an 11-minute track not available on the album, called An Astral Mystery. The RocknRollRadio web site is at: http://listen.to/rocknrollradio.